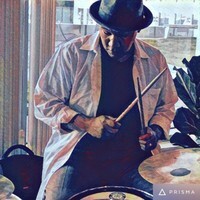 JL (John Luther) works as a freelance drummer & music educator throughout Greater Boston. Along with having displayed a signature pocket at over 160 venues & recording studios on the East Coast, he’s taught well over 600 students. Mr. Claybourne’s an alum of the prestigious Lexington High (MA) music program, award-winning LHS Jazz Combo, Funk Phi Mob drumline, a graduate of Berklee College of Music & a member of the Percussive Arts Society.